Summer is all about spending your days by the beach and drinking beers with friends. The Coogee Bay Hotel is known for their drinks and brasserie that you can enjoy whilst sitting beachside. Now they have created a very affordable and tasty, Burger Shack! Sitting amongst the palm trees in the Beer Garden, Burger Shack is the perfect spot for afterwork drinks and a bite to eat with your work mates. 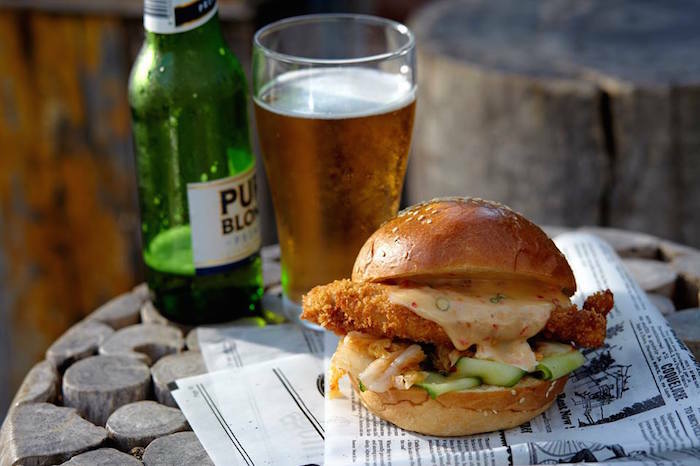 Coogee Bay Hotel has got you covered with delicious burgers, beers and the beach. Think burgers that are packed with flavour, where the sauces drip down your fingers and create a delicious mess that you mop up with fries. All burgers are $10 and they are serving up crunchy and tasty lattice fries. The Pig is the answer to all of your burger cravings. Smoked slow cooked pulled pork, lots of apple slaw, crispy onions and the quintessential smokey BBQ sauce all packed into a brioche bun. Yum! All the burgers come in baskets that you can enjoy at the pub or you can order takeaway and enjoy the perfect beachside lunch. Uncle Kim: Korean fried chicken, chilli mayo, kimch and pickles cucumber. Prawno: school prawns with shaved iceberg lettuce, tomato and seafood sauce. The Shack: the essential yet classic beef pattie, jack cheese, fresh tomato, onion, ketchup, mayo and coral lettuce. Pup: smoked kransky, cheddar melt, chilli and mustard. ← Good Culture: Food Trucks – Flying or Falling?